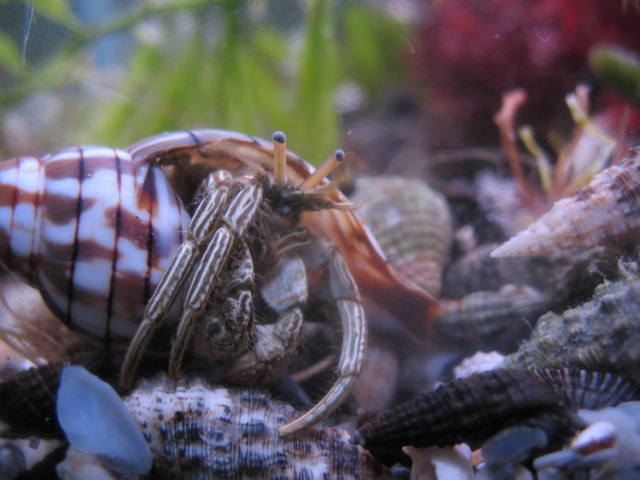 The Thin Striped Hermit Crab, (Clibanarius vittatus) is good at removing hair algae, film algae, detritus and some species of turf algae. It can grow large enough to inhabit a four inch shell, making it one of the larger algae eating hermits. While it will not eat your corals, it may attack snails for their shells. When it grows to full size it may become a threat to loose rock work. Tank size for a critter like this will largely depend on the structure of it. For example, they would do fine in a 10g species only hermit tank, with minimal rock and lots of sand. A good choice for the kids, these guys are very hardy and aren't shy. If you were adding it to a fish and mobile invert only tank, it would do well in a 50g or larger. However if the tank was a 150 gallon reef with lots of coral and little room to move; they may be crowded in that display tank, but comfortable in the 15 gallon refugium beside it. This product listing is for big hermits, that have already reached "pet size". They will all be in large shells like the one pictured, roughly 2-3 inches in size or larger. Will do our best to get them in a cool looking shell prior to shipping. This item requires Express Mail.